Discover the countless sights Philadelphia has to offer on this City Sightseeing hop-on hop-off tour! 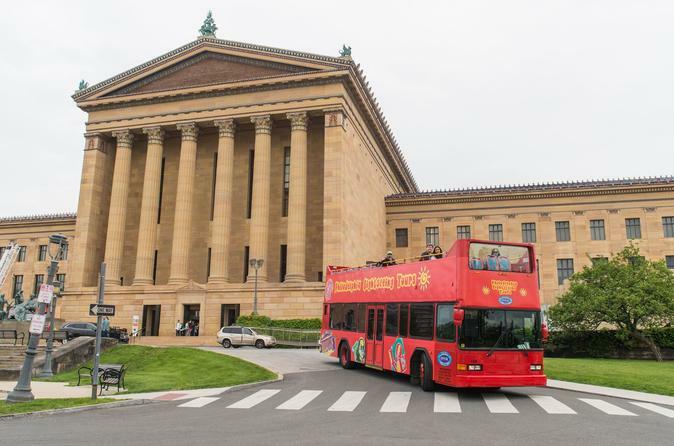 The open-top, double-decker bus offers panoramic views of the ‘City of Brotherly Love’ and makes 27 stops along a 90 minute route, allowing you to hop-off and explore at your own leisure! Travel to the city's most impressive landmarks and tourist attractions, including Love Park, Penn's Landing, Cathedral Basilica of St Peter & Paul and the amazing One Liberty Observation Deck - to name a few! Choose between a 1 day, 2 day or 3 day ticket and get ready for a truly fabulous sightseeing adventure! To start the tour from the beginning, hop on at the Bourse Building, where tour stop 1 is positioned, however passengers can also feel free to hop on at any of the other listed tour stops along the route! Hop-on and begin your sightseeing adventure, as the tour makes it way to the Betsy Ross House, a famous landmark where the former seamstress Betsy Ross lived when she sewed the first ever American Flag! Another famous landmark to follow is LOVE Park, also known as John F Kennedy Plaza, which features the cities best known monument, the LOVE sculpture by Robert Indiana. Continue admiring the sights of Philly on our open-top tour bus, as it approaches the impressive Cathedral Basilica of St Peter and Paul. Its striking architecture is impossible to miss and it’s interesting history makes it even more of a must-see landmark! The route includes stops at many museums, hop-off at the Philadelphia Museum of Art and admire the thousands of collections and exhibits on show here, you’ll also be amazed at the museum’s striking architecture. The Please Touch Museum is a unique museum along the route, it’s a museum for children inspired by teaching them through interactive activities and events! Another great attraction for all the family is the Philadelphia Zoo, hop-off here and enjoy a day out at this large museum featuring over 1,200 animals! For an unforgettable experience, hop-off at the One Liberty Observation Deck. This is without fail one of the most amazing tourist attractions that Philadelphia has to offer, hop-off and visit the skyscraper’s 57th floor for the best 360-degree views of Philadelphia’s skyline! Immerse yourself in the culture of China Town, featuring an array of colourful buildings, eateries and traditional shops, or hop-off at the Head House Square to explore one of Philly’s more historic districts, its also registered on the National Register of Historic Places!